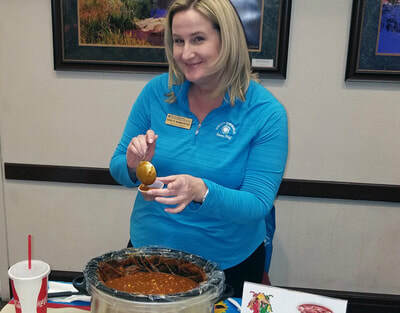 Competition for Sun City's best chili was fierce March 14. Board members and staff competed in the annual event, with the Link magazine taking home first place. Ad Coordinator Dianne Lowe and Managing Editor Jeannette Carrillo (last photo) accept the coveted cauldron trophy. Sun City’s Residents’ Forum hosted its 2nd Annual Chili Cook-Off on March 14 at Desert Vista. 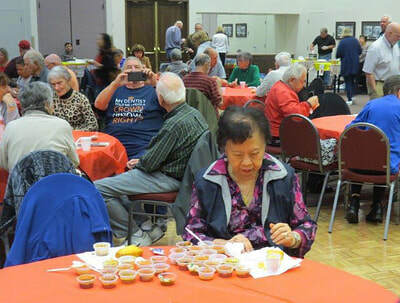 The ballroom was packed with old-timers and new residents, and everyone seemed to have a great time. The event was organized by Julie Wiedemann and Linda Genovese. The event really took off from last year, where the Forum reported having 20 entries this year, some who prepared double slow cookers that seemingly could have fed an army. 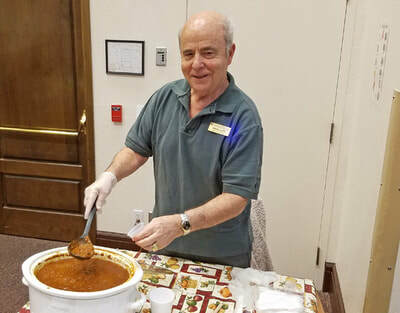 According to the Residents’ Forum, nearly 2,000 chili samples were served to the roughly 300 residents who made their way through the event’s doors. 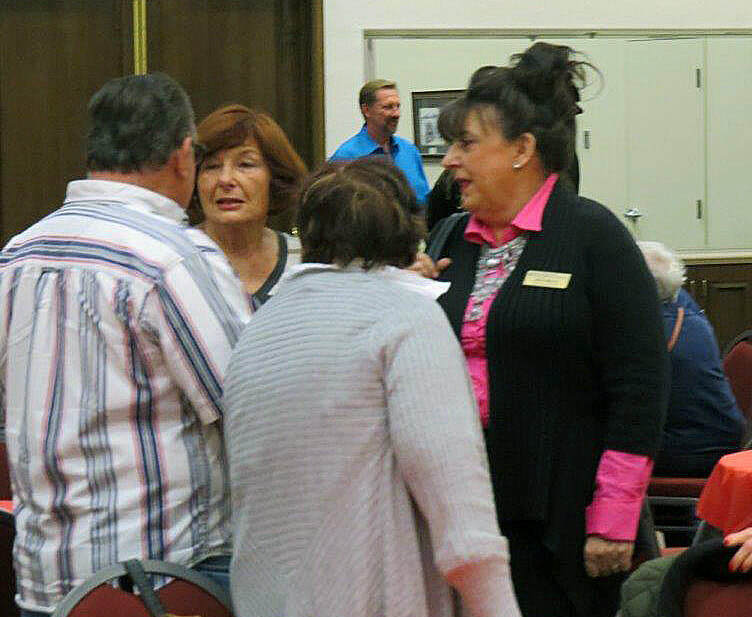 RF Vice President Julie Zerbel said, “There were over 268 people waiting at the doors at 6:45 p.m. 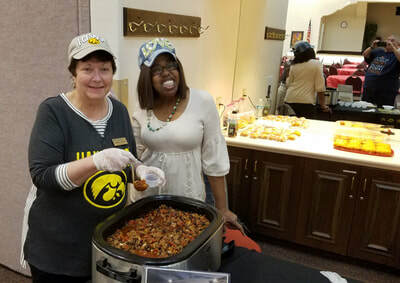 The doors opened at 7 p.m., and there was plenty of chili to go around! 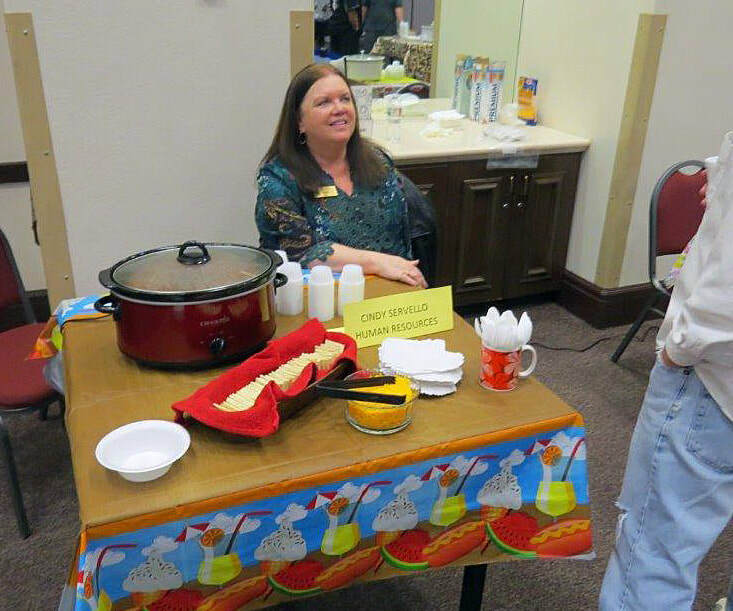 There were entries from the Fitness Department, Community Services, Administration, Landscape Maintenance, Human Resources, Golf, Community Standards, Security Patrol, Residents’ Forum and last year’s winners, the Link. There were also individual entries from SCSCAI Board members Bruce Alitt, Ellen Bachman, Barbara Holden and Leo Crawford, along with resident Bill “Boris” Holden. In the end, it was the Link that collected the winning number of votes, 40 total, to take home first place. Second place was awarded to Barbara Holden and Allyn and Hilda Ayotte, representing Security Patrol, took third. 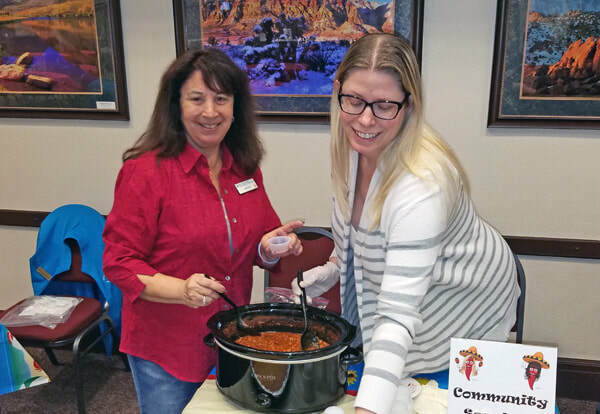 “Thanks to all participants and residents for making our Chili Cook-Off another great evening. Congratulations to the Link for taking home the chili trophy. The target is once again on their backs when Residents’ Forum hosts next year’s Chili Cook-Off,” said Karl Wiedemann, president, Resident’s Forum. On March 12, Neighborhood Watch/Community Preparedness Committee instructors Bill Holden and Bruce Spitzer invited residents to a class to learn how to survive at home for three days (72 hours) if Sun City is affected by an emergency situation. 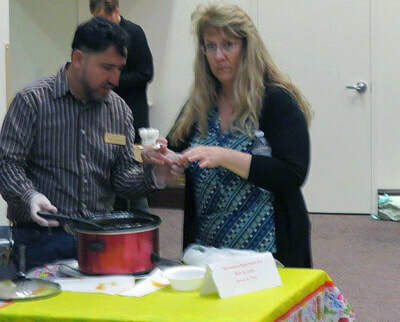 For convenience, the class was offered to residents at 10 a.m. and repeated at 7 p.m. at Desert Vista. The Committee’s instructors have graduated the entire Community Emergency Response Team (CERT) course taught by the City of Las Vegas Emergency Management Department. Accordingly, they share their expertise with residents. 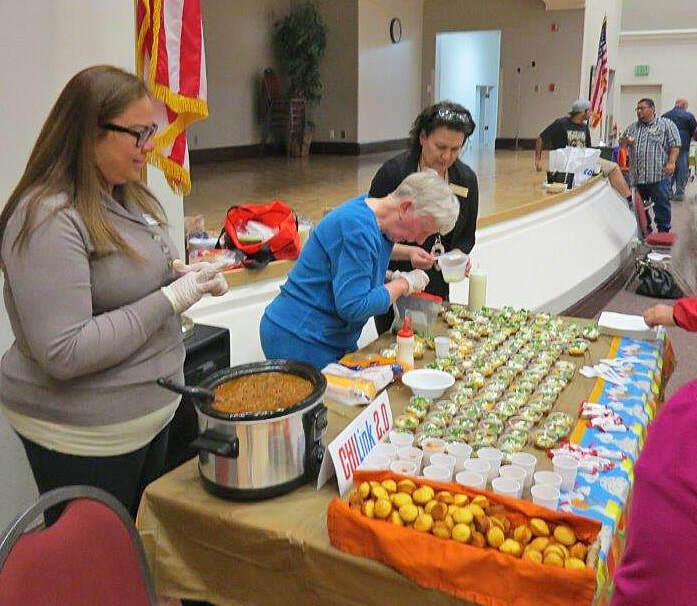 In all, 137 residents attended the free 72 class. 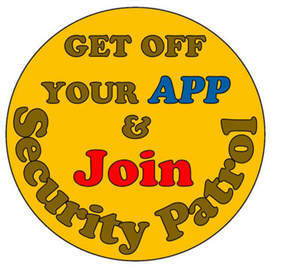 While RSVPing for the class, several residents volunteered that they live alone and are anxious to learn how to accomplish basic household emergency and security tasks. 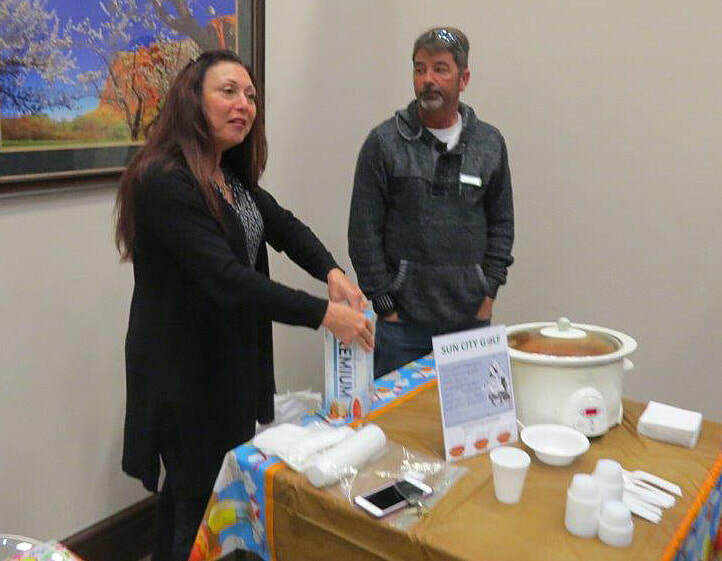 During the workshop, they were advised to have sufficient water and high-energy non-perishable foods such as peanut butter and granola bars on hand, as well as enough water and food in flip-top cans for their pets. 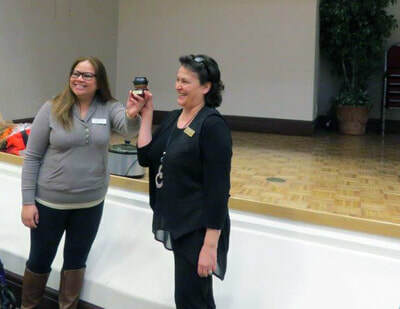 When residents asked what they should put in an emergency first aid kit, two fully-equipped first aid kits were passed around the room for everyone to inspect. The medical kits and two emergency radios later were raffled to residents. Everyone was advised to keep a supply of their prescription medications on hand and each resident took home a 48-page handout that reviewed everything taught in the class. 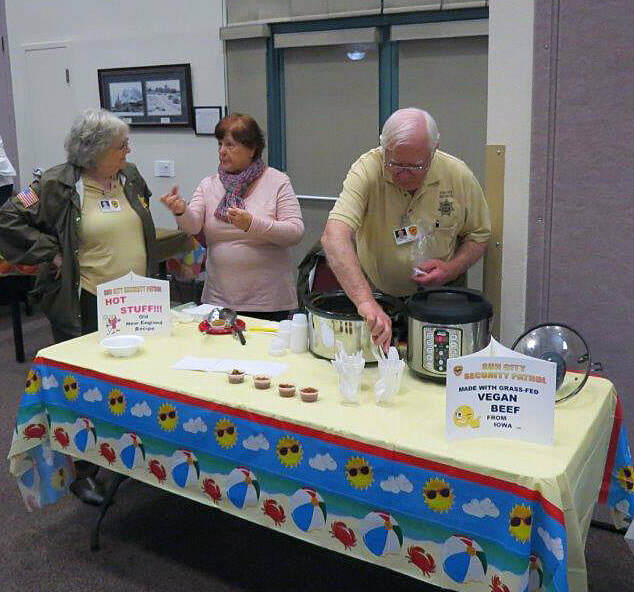 Neighborhood Watch/Community Preparedness Committee volunteers, from left, Ellen Greenspan, Bruce Spitzer, Bill Holden and Barbara Holden organized two emergency safety classes on March 12 at Desert Vista. Navy veteran Paul Lightfoot was assigned to the 3rd Preventative Medicine Unit, 3rd Medical Battalion, 3rd Marine Division. Paul’s main job was as an instructor in food services. His responsibilities took him all over the northern half of South Vietnam. Whether on the barren slopes of Mount Suribachi, the frozen wasteland of the Chosin Reservoir or the mosquito-infected jungles of Vietnam, whenever a wounded Marine called “Corpsman Up,” a Navy corpsman was there. We’ve all seen it in hundreds of movies, but there is a lot more to being a Navy corpsman than being a battlefield doc. Take, for instance, the career of Sun City resident Paul Lightfoot. Paul’s 20-year career started with a visit by a Navy recruiter at his high school in mid-state Illinois. He already had been accepted to pharmacy school at the University of Illinois, but that was really his parents' idea; Paul just wasn’t up for college at that point. “So, when the recruiter told me that the Navy would make me a pharmacist, I was hooked,” he recalled. It took some doing to convince his parents, but he was 18 and, in the summer of 1957, he enlisted. After completing boot camp, he got his promised assignment to Corpsman School at Naval Station Great Lakes. Sixteen weeks later, he began his on-the-job training at the Naval Hospital in Portsmouth, Virginia. There he would undergo two specialty rotations; medical/surgical and communicable disease. That was followed by yet another four months studying EKG and basal metabolism testing. Next up, assignment to Camp Lejeune, North Carolina, the major Marine Corps base on the East Coast. And it was there, on New Year’s Eve 1960, that he met Patricia, the future-first Mrs. Lightfoot, who was a Wave (member of the Women’s Auxiliary) also serving as a corpsman. They married 21 days later. Soon pregnant, she left the service and Paul was sent to Guam for a three-year tour. She later joined him and their first two children were born there. More education was to follow with Paul completing Instructors School. “I really didn’t want to teach, but they made it pretty clear that I didn’t have much of a choice,” he said. But, he really liked it and after graduation taught for five years, 1963 to 1968. Then even more education, as he was assigned to Preventive Medicine School in Oakland, Calif. By this time, they had four children and even as an E-7 he had to work nights at a McDonald’s to make ends meet. That was followed by Field Medical Service School at Camp Pendleton in Southern California. For a kid that didn’t want to go to college, Paul was getting a very thorough education! But the year was 1969, the Vietnam War was raging, and it was time to put that education to work. 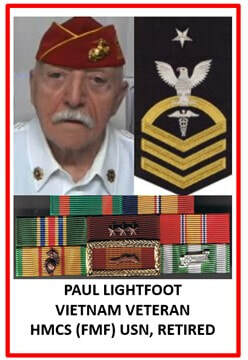 Paul was assigned to the 3rd Preventive Medicine Unit, 3rd Medical Battalion, 3rd Marine Division. A modern military unit is somewhat akin to a small city. The troops had to be supplied and fed and that meant field kitchens, which, in turn, needed to be inspected. (Think “Dirty Dining” on Channel 13.) Paul’s main job was as an instructor in food services along with insect and rodent control. His responsibilities took him all over the northern half of South Vietnam. Travel to the various fire bases was usually by lone Jeep, occasionally in a helicopter or swift boat and sometimes in a convoy. “Some of those journeys were uneventful,” he recalled. “But others were not. One time three of us were driving to a forward fire base, FB Vandergrift. The route required us to ford three streams. We crossed the first two with no problem, although they did slow us down a bit. It was getting late but we decided to push on. We arrived at the third stream just as VC patrol were entering the area. They spotted us and a short fire fight ensued. I was in the passenger seat and had my M16 fully loaded. I emptied the clip as the driver hit the gas and we took off. Fortunately, none of us were hurt. But it does show you how things could have changed if our timing was slightly different. There were numerous other instances where the old hand NCO had to advise newly arrived junior officers. Vietnam was a tough place for on-the-job training. In November 1969, the 3rd Marine Division was withdrawn from Vietnam and sent to Okinawa, Japan. The division had been in Vietnam for four years and had lost 6,859 men killed in action (KIA). Although the division is still based there, Paul’s stay was short. After three months of training local prostitutes in VD prevention, he was off to San Diego, Calif., to be followed by a tour in Oakland, Calif. By then, Paul had been promoted to senior chief (E-8). His hitch was nearing its end. The Navy elected to send him back to Okinawa; he elected to retire. The retirement decision was made easier because his training in entomology gave him easy access to a new career in the pest control business, where he held a number of sales positions. In 1993, he got married for the second time to Raquel Morales and they have been residents of Sun City Summerlin since 2003. Paul divides his time between website development and teaching Bible study classes via the Internet. He also preaches six or eight times every year at his church. 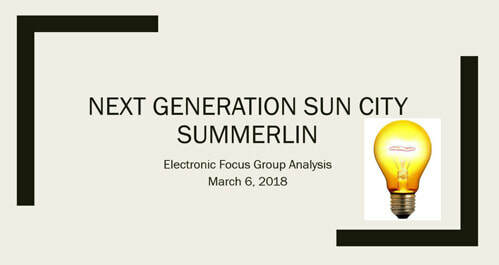 Sun City’s volunteer research group, “Next Generation Sun City Summerlin,” has completed interviews and focus group assessments with professional Realtors, as well as producing an Electronic Focus Group questionnaire that provided an opportunity for all residents to respond to a series of questions about our community. The Board of Directors received an account of the summary results from 1,285 responders, including 1,793 thoughtful comments. The complete study may be viewed by clicking on the link below. Be sure to read the upcoming story about the electronic questionnaire on Page 30 of the April Link. Please plan to attend the April 3 Board of Directors’ meeting, where recommendations for a strategic plan will be shared with Directors and residents for action to further enhance the community. Please note: The Tuesday, April 3, Board of Directors’ meeting is a night meeting, starting at 6 p.m., at Desert Vista.